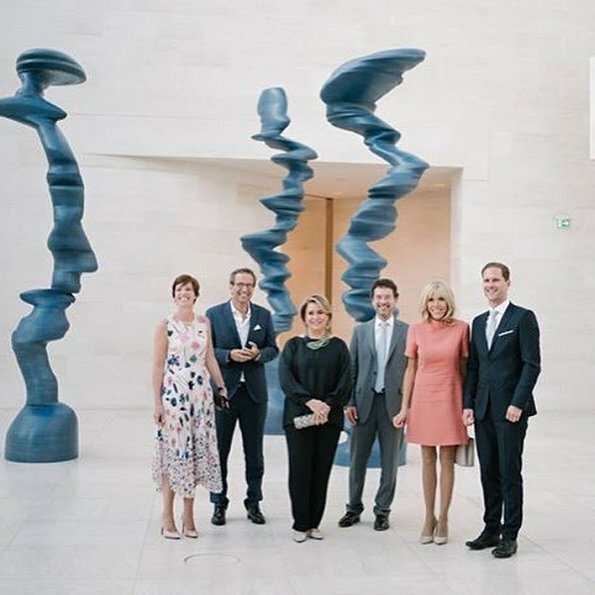 On August 29, 2017, Grand Duke Henri of Luxembourg and his wife Grand Duchess Maria Teresa of Luxembourg meet with French President Emmanuel Macron and his wife Brigitte Macron at the Grand Ducal Palace in Luxembourg. 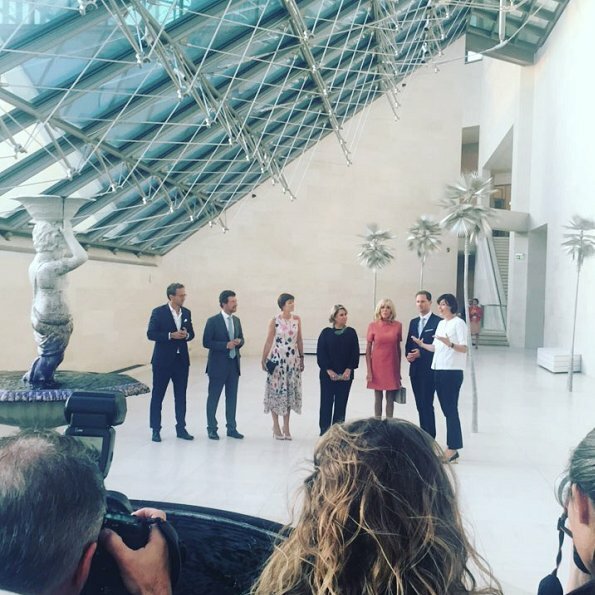 Then, Maria Teresa and Brigitte Macron visited the MUDAM contemporary art museum. 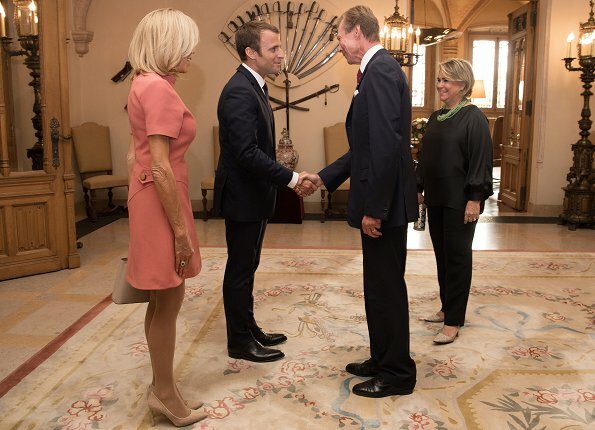 I like Brigitte Macron and she is doing a good job in her new role. But those hemlines are just too short for a 64 year-old-woman, especially the wife of a President. I realize that she is trying to project a youthful image, but this is not the way to do it. I agree my first impression was "Twiggy". Just below the knee would lol elegant. I agree. Too short is not elegant! I totally agree. Everybody can see that she is in good shape, but if her hems were 5+cm longer generally (and her trousers not that skinny), she would still look youthful AND ELEGANT TO BOOT. The short hems are ok for a private evening out or for a summer vacation at some resort, but for the president´s wife on official duty, I cannot help but find it inappropriate. I completely agree, especially since she's quite youthful and fit for her age. My first impression was that she is much more "Jet-Set" than a president's wife. I have been told that more and more french people are annoyed by Monsieur and Madame. I am not sure if it has to do with her appereance, but I think she should dress more appropriate. Especially in direct comparison to Maria Teresa, who is such a warmhearted, intelligent and sincere woman, all this (fake?) bronze teint and (fake?) blonde hair is too much. SUCH A SHAME YOU ARE TALKING IN THIS WAY... IT'S SIMPLY JEALOUSY, WAY OF BEING NASTY WITH OTHERS... OF COURSE YOU ARE NOT SO WITH ONLY ONE PERSON, BUT YOU ARE SO WITH EVERYONE. THE QUESTION IS: WOULD YOU HAVE ONE DAY A BEAUTIFUL SOUL?! Stop shouting. They're opinions - you may not agree, but that's all they are. I may not like what's she's wearing nor her haircut but I assure you I am in no way jealous of the woman. Nobody has said anything about the woman's "soul" - I'm not sure how you are qualified to speak to its beauty or not, any more than anyone else here. OK it is very rude and impolite to shout like that. You have your opinions, other have right to their own ones. It is not at all jealousy to not like her hem length, how could it really be? Some writers here are also much older than Birgitte Macron. Nobody of us, also you, do not know at all has Birgitte beautiful soul or doesn´t she have. I agree wholeheartedly. It seems these dresses are all she wears! For me the style winner was the lady in the white colorful dress. She looked fun and fab! Agree. She is trying way too hard to compensate for the very large age gap between her and her husband. She looks silly. Maria Theresa looks really good, however, as the pants outfit is flattering. Please be polite and respectful for anyone. The elegance of Brigitte Macron is quite evident. 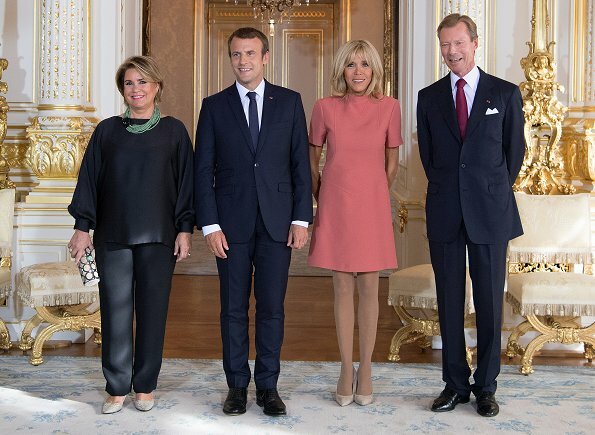 I hate to say something nasty, but even royal women 20 years younger than Brigitte Macron don't wear clothes this short on official visits. The Grand Duchess almost always looks so well-put together and does in these photos The black is a bit "heavy" for late summer, though. I love the flower-strewn dress on the other lady. 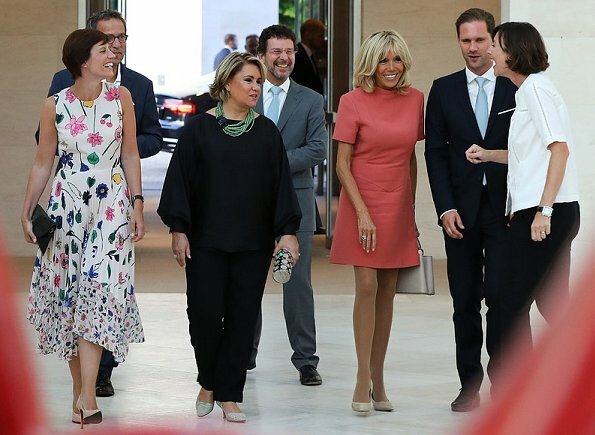 Brigitte Macron is an elegant woman, and her dress looks wonderful. I don't know why she reminds me of Brigitte Bardot..............But yes, her hemlines are way too short. She will never pass for a 40-year old. Even a 40-year old would not wear dresses that short anyway. All she's doing is attracting attention in a negative way. Birgitte Macron would look so much better and younger with longer dresses. I totally agree with Beverly 24. I agree, Pat. She often wears this same 1960s little-girl shape/style and it's just not good on her. And this dress seems to not fit well and is wrinkled. And referring to Grand Duchess, I think HKass is right: too dark for the time of year and the kind of event. I do not understand why people here say that Brigitte is in good shape, only because she is slim? I do not think she is in good shape at all, and i am not gonna say more because otherwise people here say that i am insulting. Brigitte Macron is in a very good shape. Iris, I feel I can read your mind and agree! I think that I know what you mean, Iris, and I agree. She is in good shape on a very superficial level, but actually looks both fake and unhealthy. The Grand Duchess's black pajamas are not good. Too sombre. Maybe a different colour would have worked? I love that floral dress. It's one of the nicest dresses I've seen this summer. Brigitte Macron is an interesting person, but she shouldn't try to look like a sixties-girl . I have the impression, that her stylist isn't her friend and her hairdresser is her enemy ;) .This hairstyle was great for the young Mireille Darc, it doesn't work for a woman, who is 64. It's ok to look not like a grandma, but this is too much. I've seen some photos of her before she became first lady - she looked handsome. Vanessa,je crois aussi qu'elle porte des perruques rien ne me convaincra de contraire. 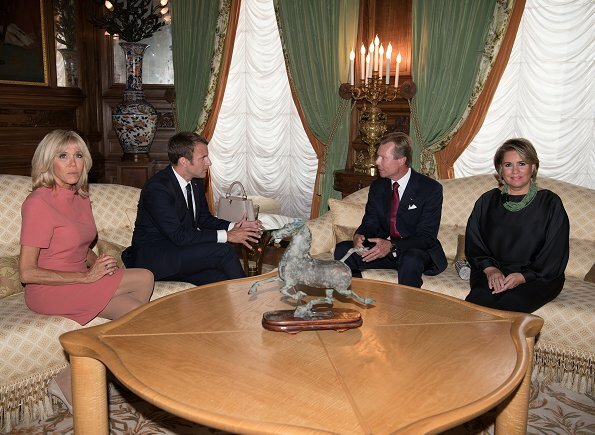 moi j'aimerais simplement quel'on dise à Madame Macron qu'il ne faut pas croiser les jambes lorsque l'on est assise et en plus avec une robe courte ! The only thing I like is the colour. I think it needs a more defined waistline, at least two more inches in length and she needs to stop with the over structured shoulders which make her look out of proportion. Personally, I never mind about skirt length and age if the wearer can carry it off but I don't think it's very flattering for her. I agree about her hair - the style isn't flattering; it's too heavy for her fine features. It's a shame because she's an attractive woman and she could look so chic. I think the choice of solid colors was wise for the ladies. They went to view artwork, not be it. That said, I agree the floral on white background dress is nice. i agree with you all but we must recognise that this woman has much courage and a huge amount of self confidence to be married to such a Young and handsome man. Personally i would feel insecure every day...maybe rhe way she dresses is the way to feel at ease with him. Complétement d'accord. Ce n'est pas en s'habillant ainsi qu'elle effacera la différence d'âge. That's it, Christine. And you are not nasty. You are realistic. The Grand Duchess is stunning in her pants outfit although it might be a little too blousey. I hope she trades in all those boxy coat/dresses for this softer style. She can adjust fabric to suit any occasion. I'm unable to comment on Mme. Macron.